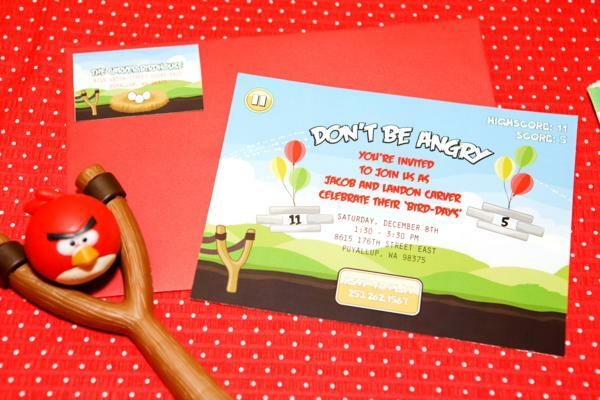 This adorable ANGRY BIRDS BIRTHDAY PARTY was submitted by Jen Carver of Banner Events. This party looks like it was so much fun! Everything is absolutely adorable! 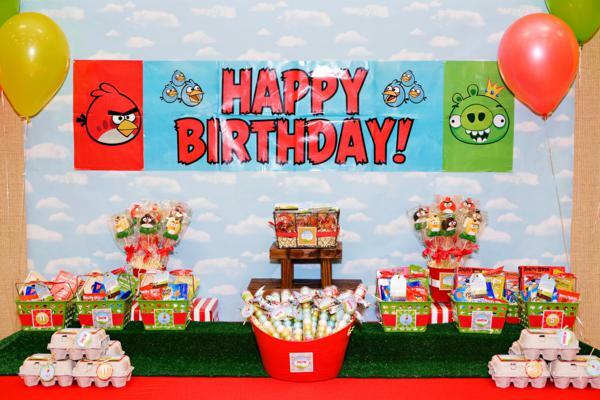 – “Jen Carver, of Banner Events, here to share a fun new “Angry Bird-day” party theme launched a couple of months ago in honor of two of my sons’ birthdays! 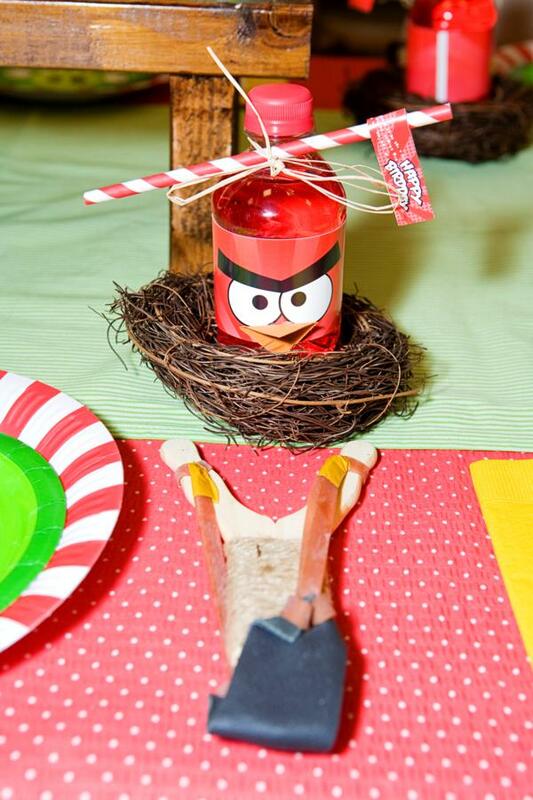 Feathers were flying at the Carver “birdhouse” the as we busily prepared for 20 guests to come “crash” the party. 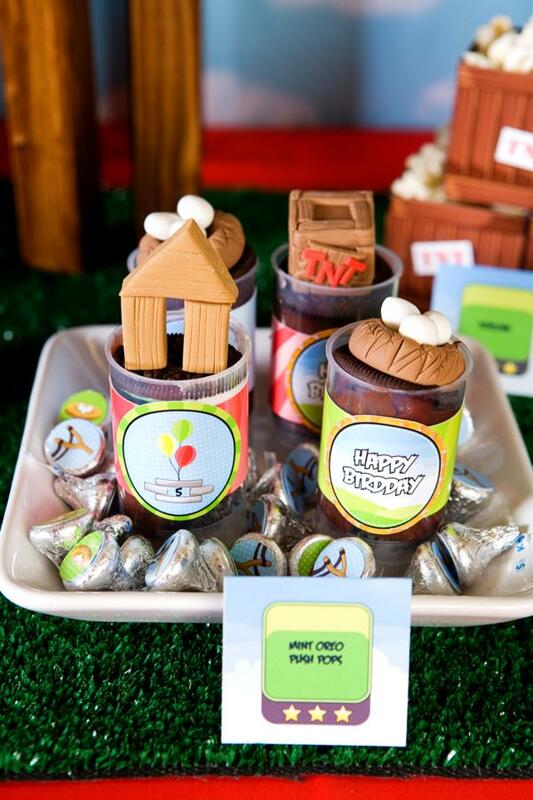 December is a busy enough month as is, but add birthdays for two children to the mix and you’ve got downright chaos. To simplify things this year, we decided to host a combined birthday party for my son Jacob (turning 11) and my son Landon (turning 5). 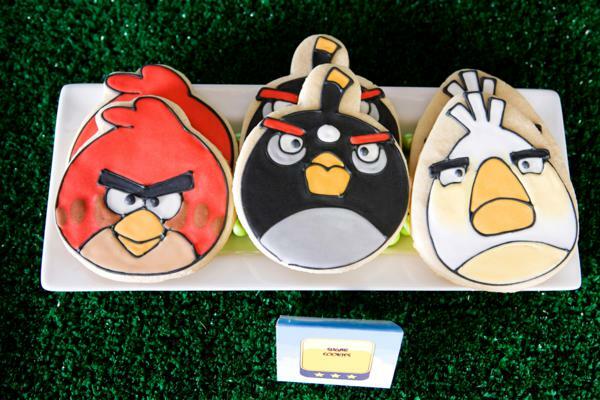 Since they are both huge gamers, we knew this theme would be perfect! 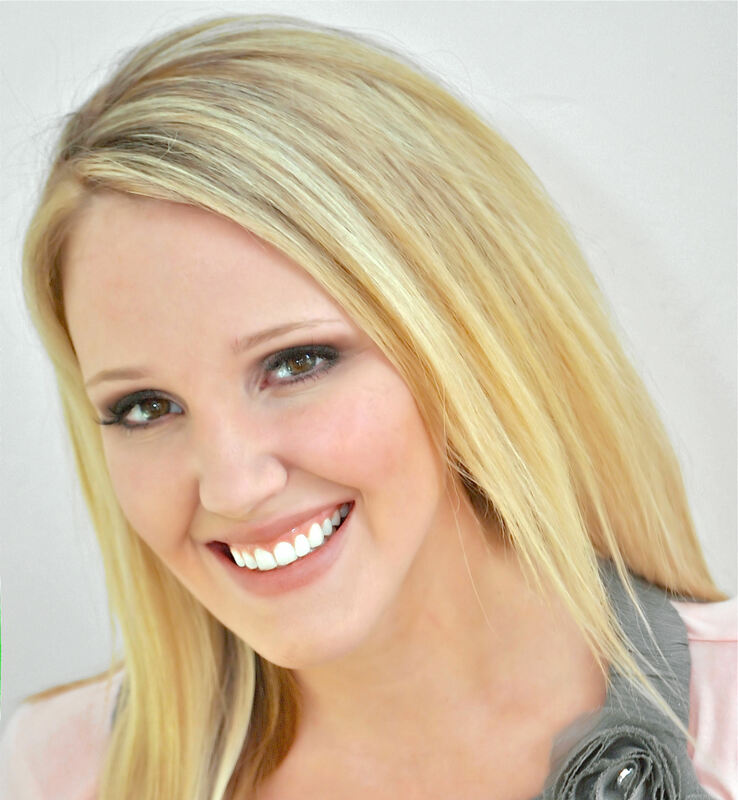 I hope you enjoy the colorful photographs, captured by the amazing Karina Rigtrup of A Fresh Take Photography. 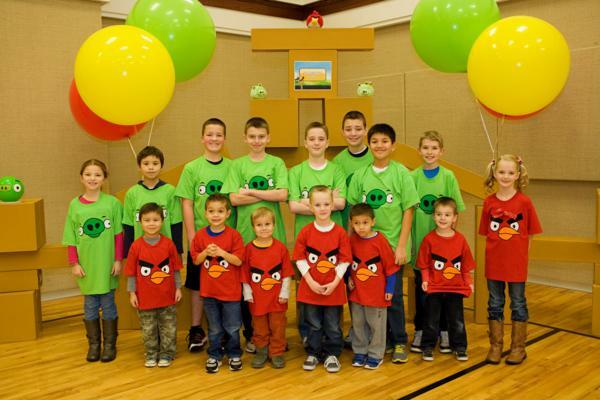 No Angry Bird-day party could possibly be complete without kids dressing the part! 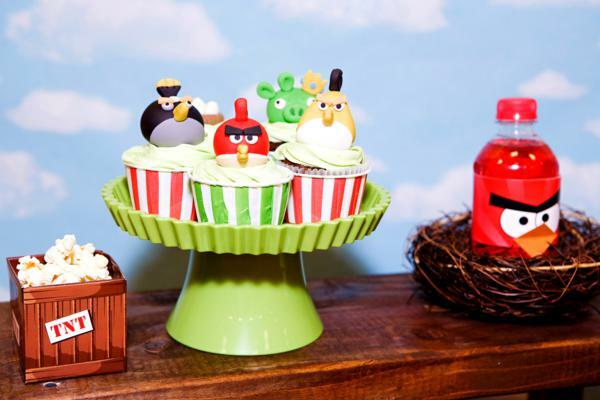 Party goers were divided into birds vs. pigs and each received a custom shirt designed and sewn by the talented team over at Create Sew Embellish. 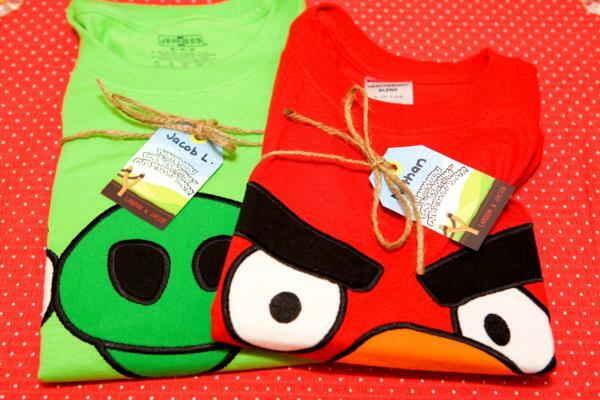 Shirts were personalized with a little Anders Ruff hang tag for easy distribution. 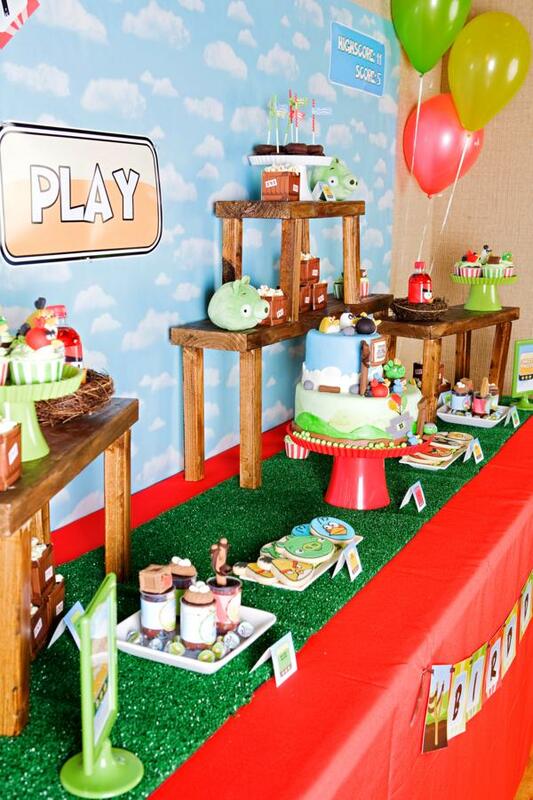 My favorite part of the decor was the dessert table designed to look like a screenshot of the game. Notice the play, pause & high/low score buttons designed by Anders Ruff. Cloud paper served as the background, and the table runner was artificial grass. 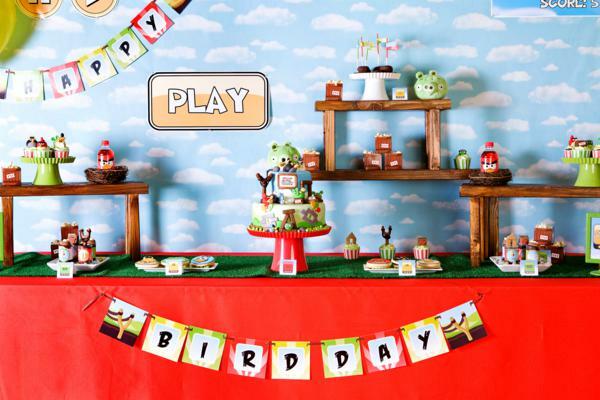 The addition of the wood stands, built to resemble the wood structures that get knocked over by the birds in the game, really helped to bring the table to life! 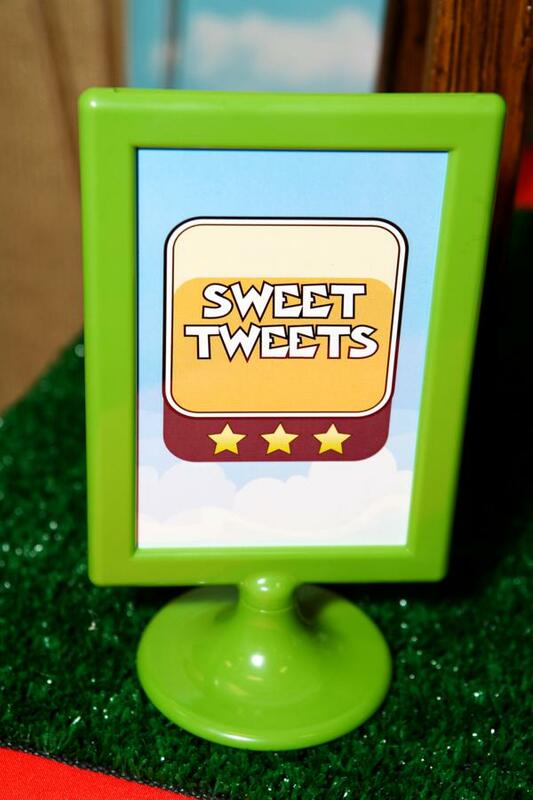 They were perfect for displaying gorgeous sweet “tweets” from some of our favorite dessert artists. The kids loved the TNT favor boxes filled with popcorn (Anders Ruff), the gorgeous sugar cookies from Sweet Surrender Cookie Co., , the chocolate donuts dressed up with polka dotted treat sticks (SmashCake Studio) and party flags, & the unbelievable fondant topped cupcakes and mint chocolate push up pops from Lynlee’s Petite Cakes & Edible Details . 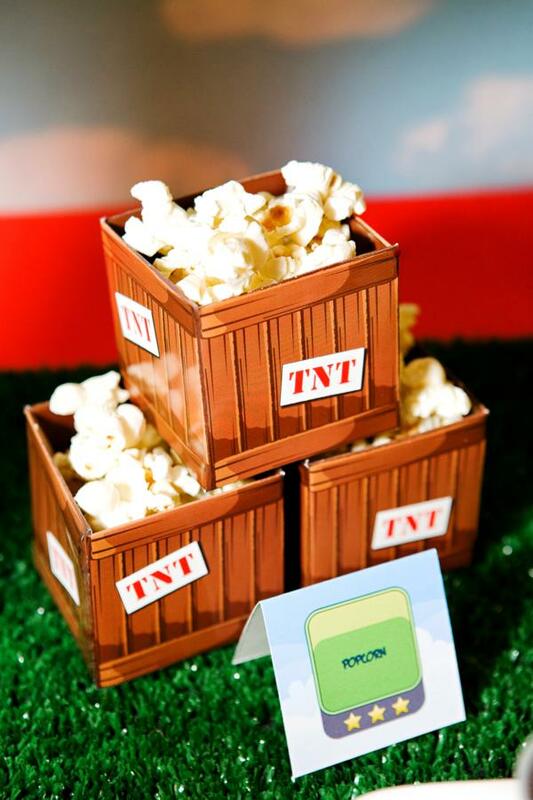 Plates were filled and re-filled with these treats! 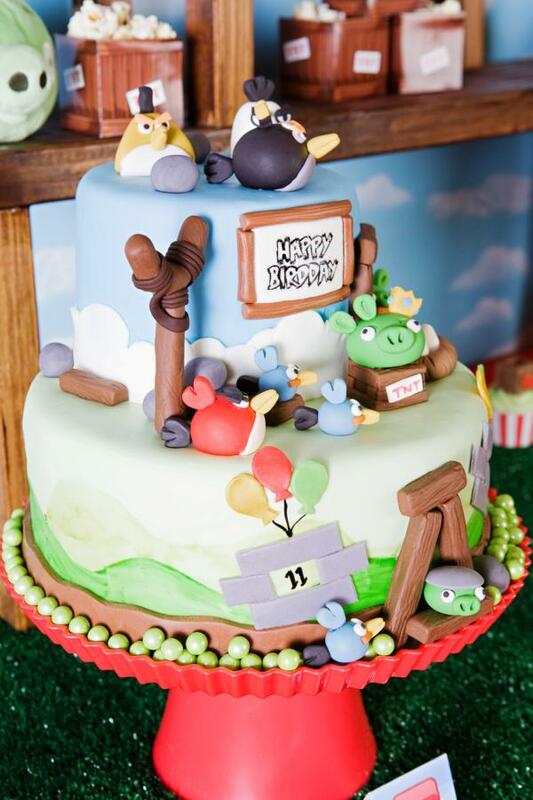 The focal point of the dessert table, was definitely the incredibly delicious two tiered cake with molded chocolate & fondant scenery designs by 4 Kids Cakes, and 3-D fondant birds and game elements by Lynlee’s Petite Cakes. Some of the same dessert table design elements carried over to the dining tables, successfully tying the tables together. 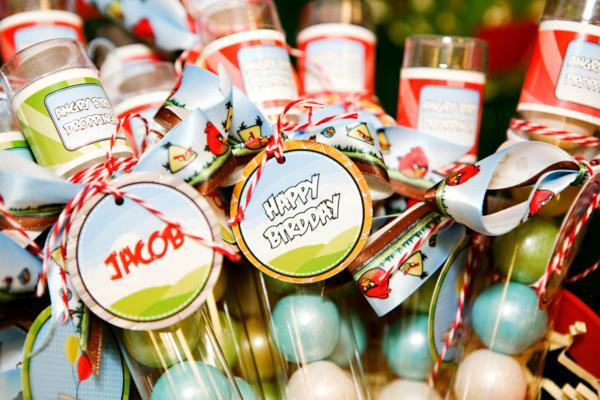 Highlights from the dining tables included bird nests at each place setting which housed beverages with colorful custom beverage wrappers & fun striped paper straws & party flags. 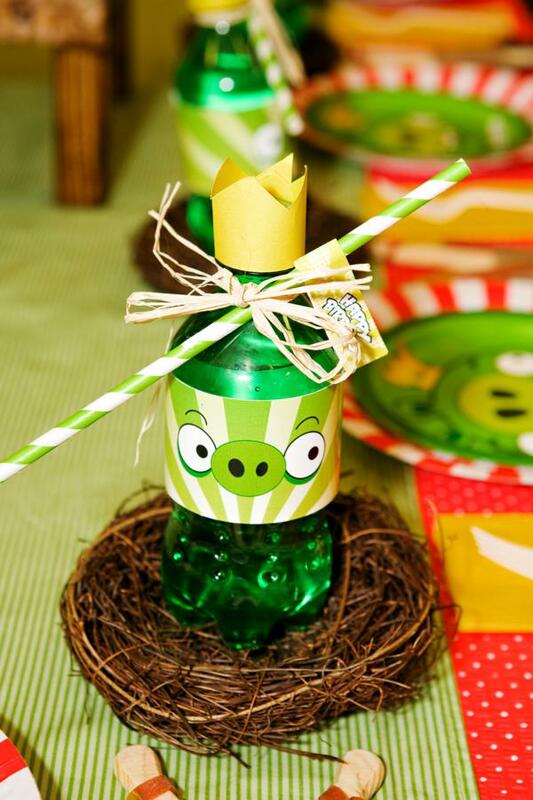 I added a few DIY details (the beaks on the birds & the crowns on the pigs) for a fun 3-D element. 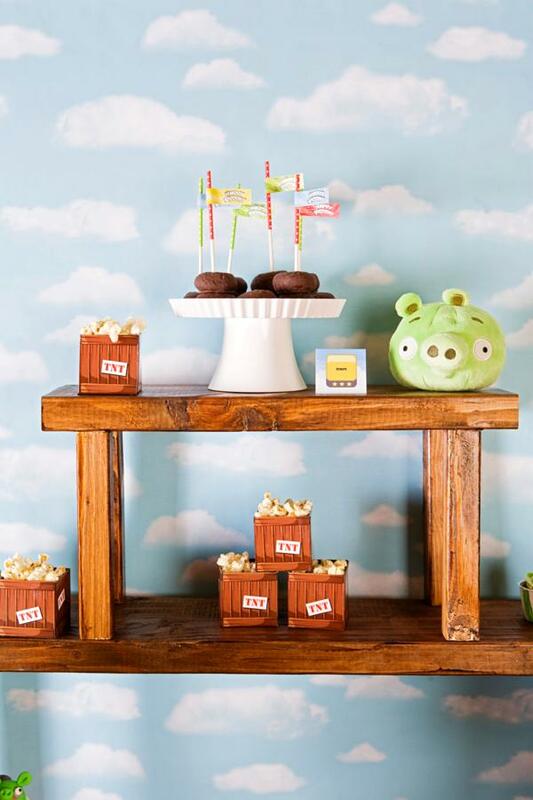 Colorful plates from SmashCake Studio were paired with licensed plates for a fun pop of color, and a slingshot added a bit of foreshadowing for the fun to come! 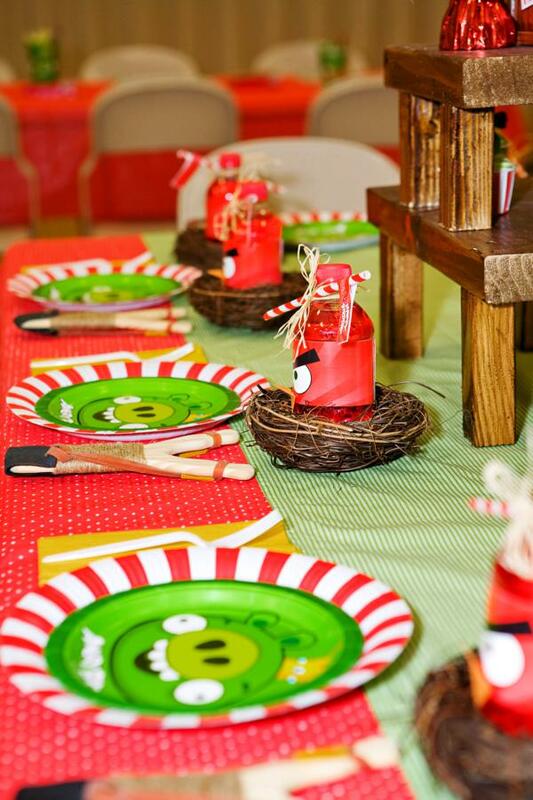 Planning a party that will appeal to both 4/5 yr. olds and 11/12 yr. olds can pose a challenge for any parent. I put my thinking cap on and also adapted a few ideas I found while searching the web. 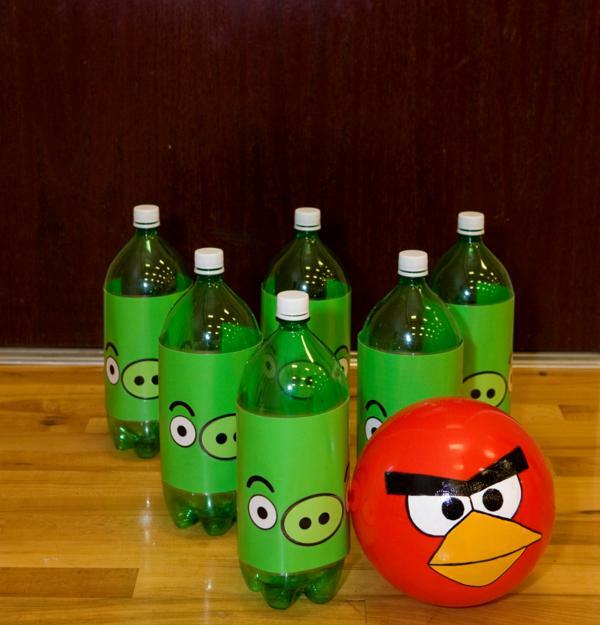 Here is our line-up of Angry Birds inspired games. 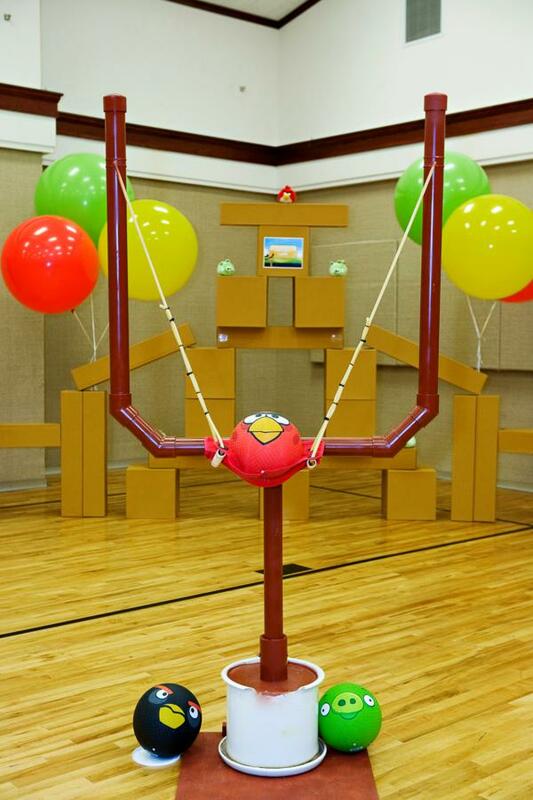 A classic carnival game, balloon darts are always popular with older kids. 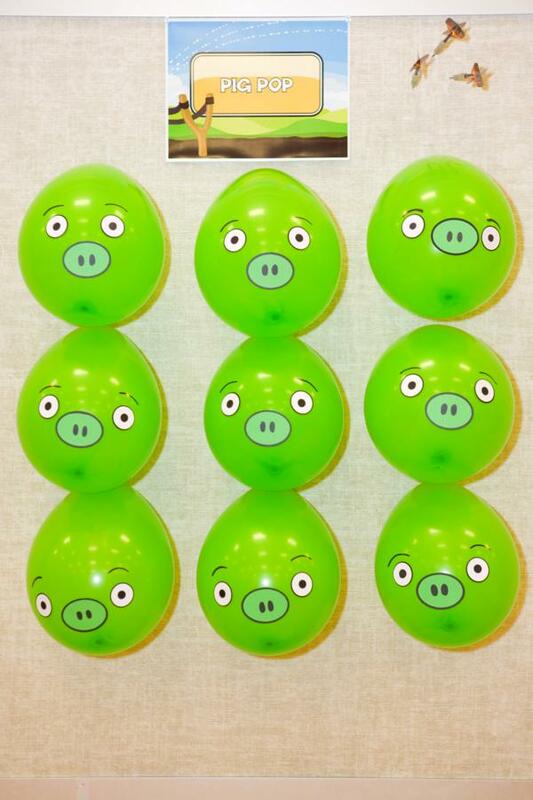 We added some pig faces to lime green balloons and created a fun ‘pig pop’. You can purchase a cheap set of steel tipped darts (less than $5) from Walmart. 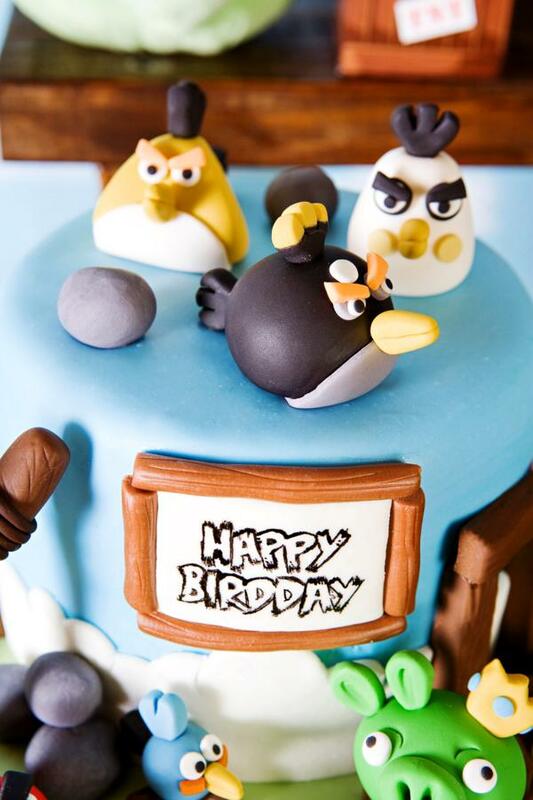 If you’ve ever played Angry Birds, you know that those bad little piggies stole the eggs from the birds’ nests causing them to become angry! In our game, the kids got to capture the eggs back, saving them from being eaten by the pigs! We divided up into mixed teams and hosted a relay race. Contestants rode scooters, rescuing one egg at a time in their sacks. The team with the most rescued eggs at the end of the time, won! 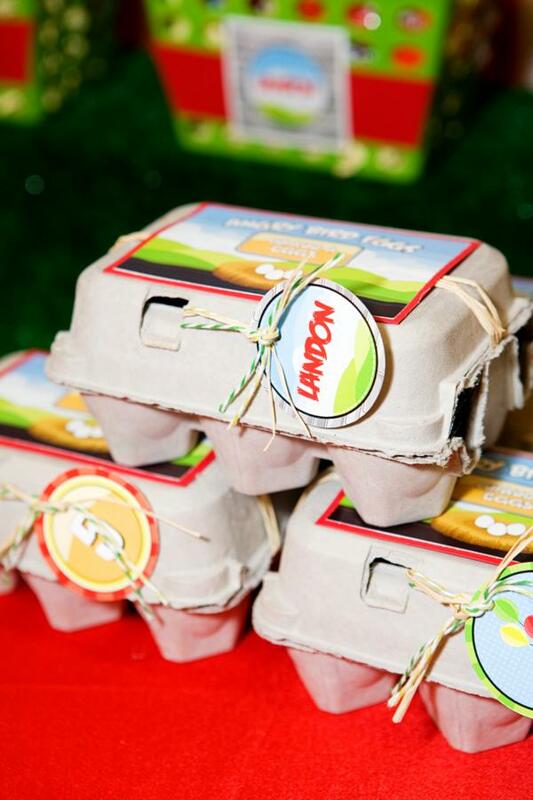 Each child was given an embellished egg carton (purchase these darling mini egg cartons from Shop Sweet Lulu) to hold 6 golden Angy Bird eggs (Sunny Bunny Easter Eggs) filled with various candy. 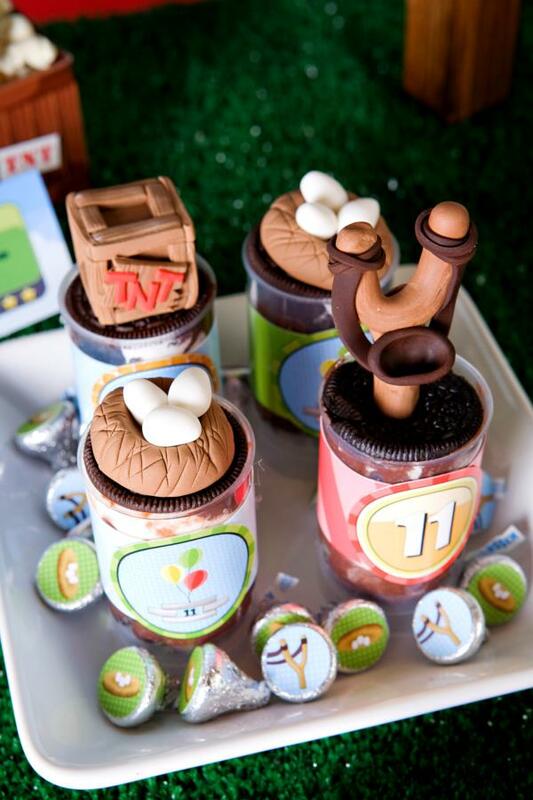 These were added to their favors to take home at the end of the party. 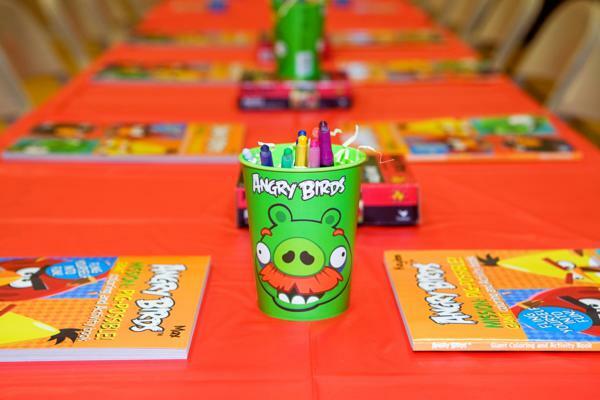 Another classic party game, Bingo, received a makeover for our Angry Bird-day celebration. 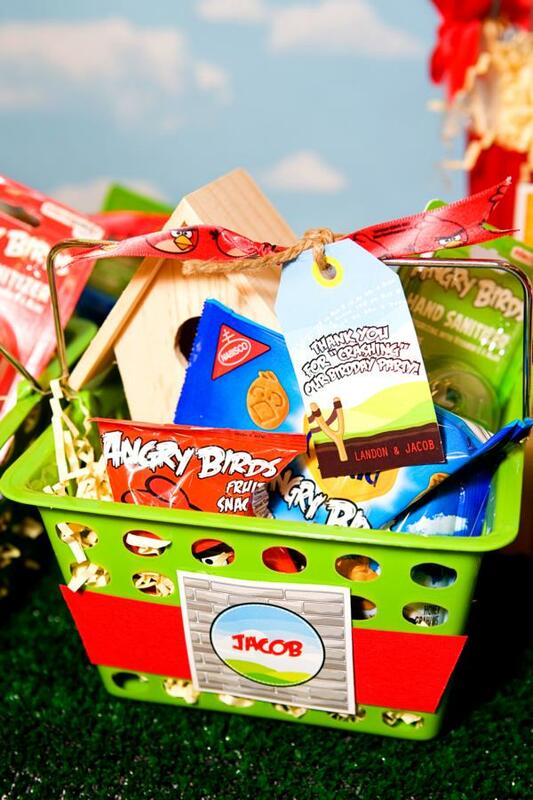 Custom blank ‘Bird-O’ boards were designed for me by Anders Ruff. 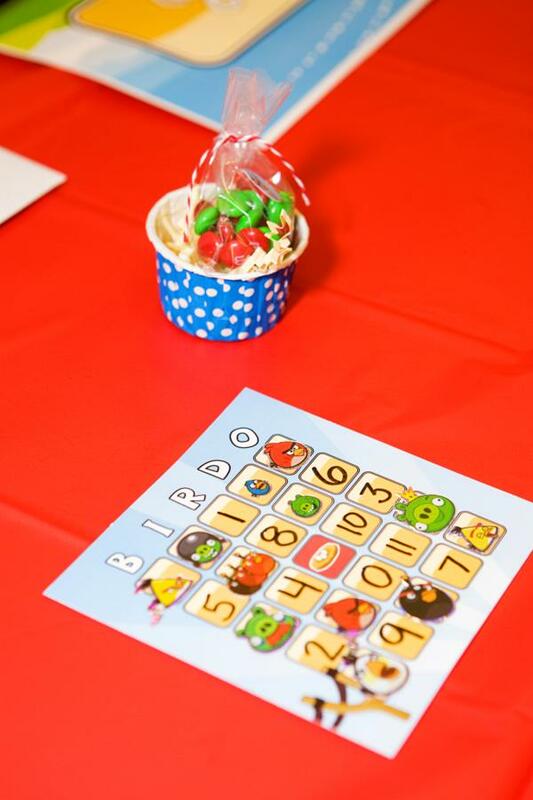 I added a variety of character stickers and numbers, filled colorful polka dot baking cups from Shop Sweet Lulu with red & green M&Ms to serve as markers, & we were set! Both age groups enjoyed playing this game. 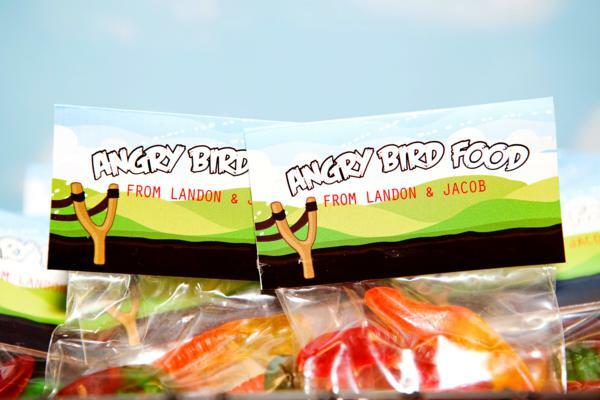 Prizes were licensed Angry Birds sticker sheets. I always like to have a “self-start” activity center established that gets party goers busy in the celebration from the moment they walk in. A coloring and puzzle station works perfectly. It’s easy enough that kids can help themselves while you are still trying to welcome guests, check coats & collect gifts. The Dollar Tree had these licensed puzzles, and the coloring books were found in the dollar spot at Target! So so original! 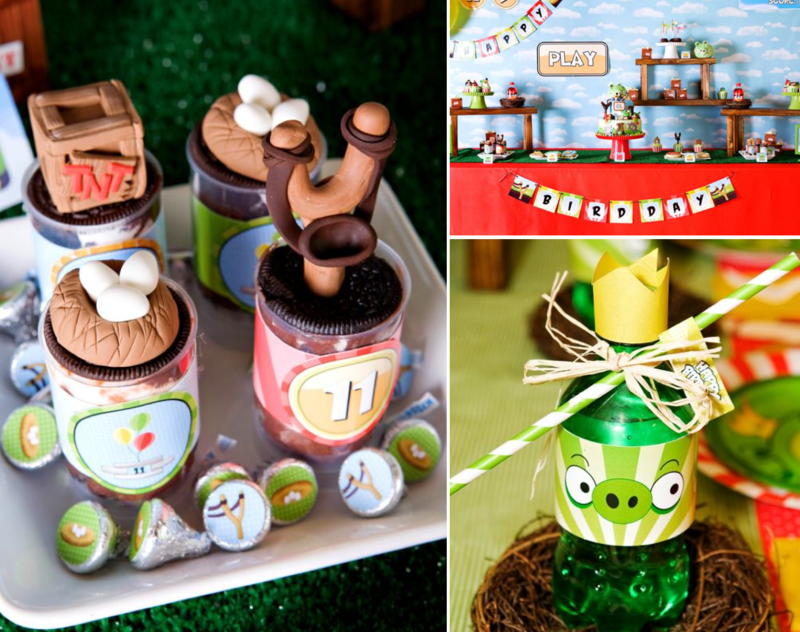 Love the table setup, the cake, the adorable cupcake toppers and the original drink bottles! And the kids look so cute with their shirts! my favorite thing is the play button! i love the attention to detail! Everything about this party is awesome. 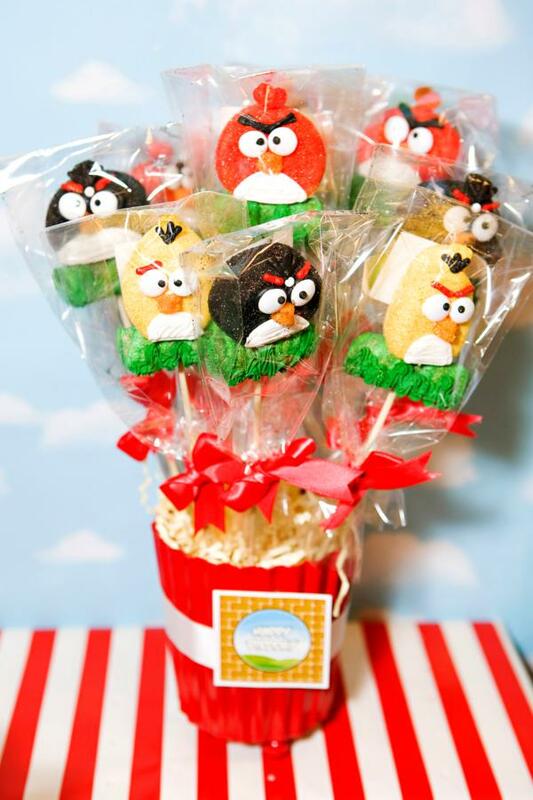 I’m trying to get ideas because my almost 4 year old wants an Angry Birds party too. The link for the slingshot tutorial is not working. Do you have another? I love it!! Do you have any sort of instructions for that slingshot? I desperately want to replicate that. Thanks so much! Such a fun party!! This is all the instructions I have: “I put my handy husband to work on an original design for a 6 ft. portable slingshot using heavy duty PVC pipe, surgical tubing, cement, a ceramic pot & wood base for support.” You could also contact the party stylist to see if she has any more detailed instructions. 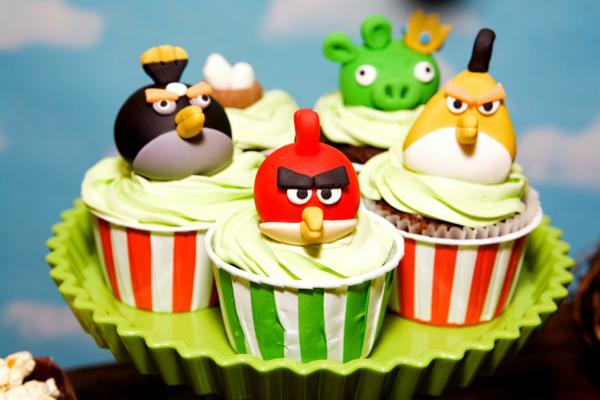 If you do get them, would you please share with us?? XOXO!